We’ve embarked on a quest leading to CD Projekt RED’s HQ in Warsaw, Poland, to play the final expansion to The Witcher 3. 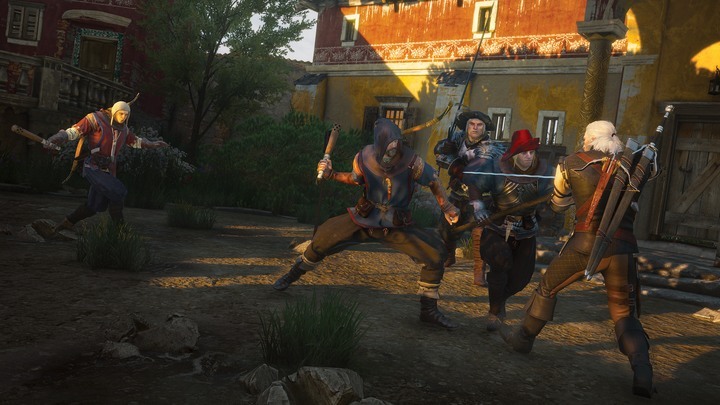 Will Blood and Wine provide a solid portion of content, giving the players a satisfactory conclusion of The Wild Hunt? The best way to fully grasp the idea of Toussaint is to compare it with Velen. The unusual nature of the new location is first hinted at on familiar turf. When Geralt slowly rides into one of the gods forsaken villages in the marshes, the presence of horses in golden armor foreshadows something different. Against mud and poverty, everything that originates in Toussaint seems grotesque and outlandish, as if it came from another land or another dimension just like Ciri did. 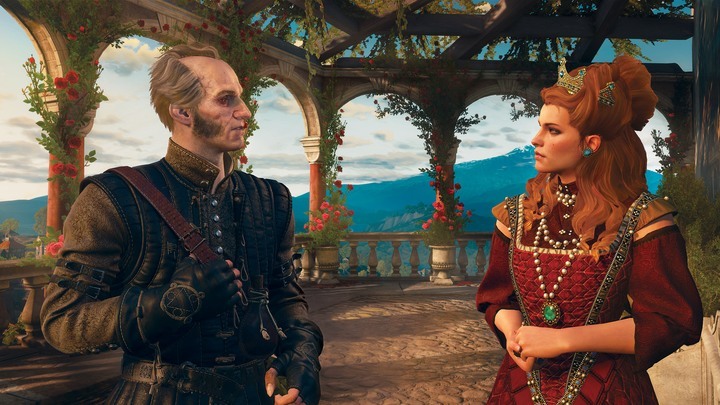 Two knights of Anna Henrietta, the duchess of Toussaint, are actually old mates of Geralt’s known from the books – but they aren’t the first nor the most notable characters that we’re going to meet in this expansion. Together with Geralt, we can watch as these two virtuous noblemen wearing glittering armor fitted with colorful feathers are trying to talk some sense into murderous, thieving bandits. Five minutes and some fifteen dead bodies later, we are on our way to Toussaint, where pompous vocabulary and chivalric qualities of our companions fit just right. Land of blood and wine? Toussaint is an entirely new region on the world map of The Witcher 3, and so Blood and Wine is a fresh Witcher experience. Remember Hearts of Stone, and the opinions that followed its release? People praised its focus on the main plot and similarities to the books. Also, the fact that there were fewer distracting side-activities made for a more juicy storyline. 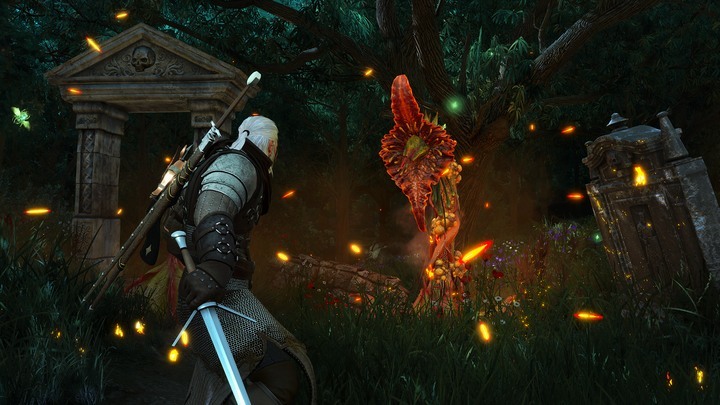 In this expansion, we get a bit of both advantages – it’s like a witcher-y second helping. The new area is quite large and brings loads of quests, monsters to hunt, bandits to quarter, treasures to find, and more powers to acquire. Add a range of new mechanics (which I’ll discuss later in the text) and we indeed get a new, if smaller, Wild Hunt of sorts. Isn’t it what we’ve all been waiting for? Beauclair and the surrounding areas are totally different in terms of esthetics than anything we’ve seen so far in The Witcher 3. You’ve probably seen the promo materials featuring vibrant colors and the contrast of the clear blue sky with celadon green of the grass, and that’s only the beginning. The capital city is stuffed with colorful buildings in a range of pastel hues, separated by meandering cobbled streets. The decorations are so detailed that it sometimes feels as if the embellishments had embellishments of their own. That’s quite an architectural inception. Then there are the inhabitants, who would probably call a violet-green outfit “mundane”. Not to mention their customs! We’ll have plenty of opportunities to get familiar with the way of life of people here, mostly during quests, which – as we know well enough – are the essence of The Witcher. It’s nothing but the real deal here; missions brimming with dialogues and focused on the world creation. Blood and Wine has plenty of such quests, both main and additional, and the amount of new stuff to do doesn’t come at the expense of the pace or “density” of the game as a whole, which were the things we loved in Hearts of Stone. The pace of the main story is beyond what we’ve seen in the core game. The writers meticulously build up the atmosphere, blending motives reminding us of movies such as Seven or Le pacte de loups, and send us on a chase after a mysterious beast. Once again, a new Witcher expansion reminds me a lot of Season of Storms (a new, stand-alone Witcher novel, yet unpublished in English), specifically the storyline of the investigation conducted for the Rissberg sorcerers. There’s this eerie aura of mystery, and the beast is always one step ahead of us, leaving behind only corpses. Apart from that, the story has a sense of fluidity; it’s a combination of a couple of intertwined threads. We meet subsequent characters, our goals change, and so does the nature of the quest itself. The circumstances become increasingly intricate and there’s no saying what’s going to happen next. And, as the developers themselves say, a lot happens in this expansion. Have I mentioned that many characters from the books will be making a return? I know that the readers of the saga are waiting mostly for one person in particular, who could already be seen in the promos. Let’s just say that the developers think this character fairly important, and Geralt – that cold and cynical mutant – actually hugs the guy when they meet, which means he’s even more important to him. What really impressed me during the first two hours of the game was the pace. I’m not talking about plot twists at every corner. In this expansion, stuff happens, and it happens all the time, which is best confirmed by the fact that during those two hours I experienced four boss fights, all of them really intense. The premise is similar to the one in Hearts of Stone, although implemented with even more flair. Each encounter was carried out spectacularly; sometimes they break out spontaneously, other times they are preceded by a longer build-up. More importantly, you can feel genuine pressure during every one of them. 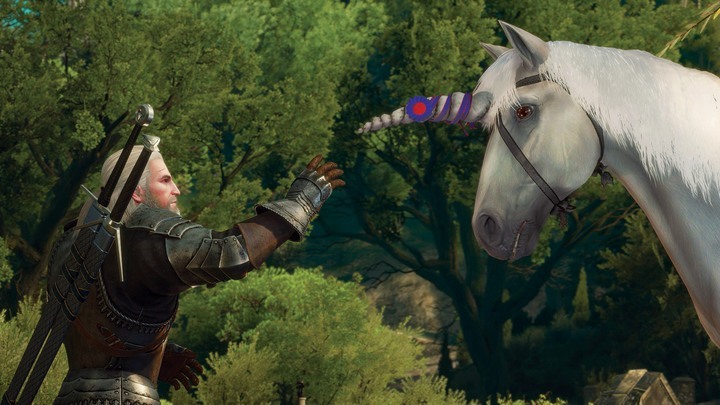 Those aren’t fights where master-Witcher Geralt has everything under control and manages to dodge every attack. The duels in Blood and Wine are closer to what we have seen in the Lullaby of Woe trailer. The developers have consciously chosen to go for the fights that are more in line with the books – Geralt, although well-prepared, barely makes it out alive – and it was a great decision. This doesn’t even have anything to do with the difficulty level. The enemies jump, roll, dodge, teleport, counter, parry, and then send a storm of blows our way – either quick and deadly, or heavy and crushing. Whether you’re playing on easy or hard doesn’t alter the reception so much. The tension is palpable, and we have to react immediately. Luckily, the White Wolf doesn’t waste any time. He’s growing older, the monsters grow fiercer, and something has to be done about it. At this point, we can use the new additions to the mechanics and gameplay. All the elements of Witcher Gear now have a grand master level, and wearing the whole set finally gives special bonuses! I liked the fact that the devs tried to avoid empty mathematics here. Wearing three elements of Feline armor makes strong attacks modify following quick attacks, rendering them more efficient. Wearing the full set will reinforce back stabs. On the other hand, you’ll find more statistics in the mutation system, which is a completely new layer of the character progression system. 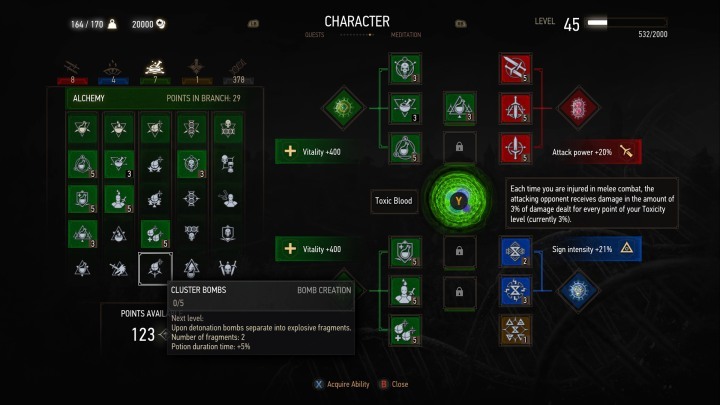 In exchange for mutagens we can “invent” new Witcher mutations, only one of which can be active at a time. What’s more interesting, further inventions will allow unlocking more slots for the regular skills. In the broader perspective, this allows the new system to nicely merge into the existing mechanics, instead of existing in a limbo. This is a really elegant solution. Same goes for the interface. It was totally overhauled, but experienced players shouldn’t feel lost here. The changes seem very natural, and going back to the old interface can only raise questions such as “why wasn’t it like that from the beginning?”. Choosing signs is quicker and doesn’t have to be confirmed with a press of a button. After collecting a letter or a book we can instantly jump to its contents. The equipment and development screens are more functional and clearer. It’s all very pleasant to watch and to play. Although those changes are directly connected with the release of the expansion, they will be made available for everyone via one of the upcoming patches. Although the main storyline marches on and doesn’t look back, Blood and Wine also makes time for other activities. It is encouraging that the team at CD Projekt remained faithful to their style and made most of the tasks directly related to the setting, allowing us to deepen our knowledge of Toussaint and have a taste of the local customs. Let's take the tournament for example. As it usually happens, a good old jousting competition takes place exactly at the time of our visit, and we can take a peek behind the scenes of this event when not busy uncovering bloody plots. Of course, it’s an excuse to re-introduce the classical "Geralt in a china shop" theme. The witcher can use the occasion to swear absurd oaths, choose a coat of arms, and try to impress the ladies. All of this while brimming with unparalleled enthusiasm for which we love this character. But the tournament is also a place where the events are put in motion. This rather big patch of land will give us the opportunity to take a stroll among the tents of various knights, while moving past nosy children, flashy-dressed men, and women with umbrellas. In the background we can hear constant hum of conversations and the clatter of clashing swords – in a word, a veritable spectacle and, above all else, a place where we can soak in the atmosphere of Toussaint itself. An observant player may even notice the birds singing – a sound unheard in Velen or Skellige. Starting from the details and all the way to the bigger picture, we can see that over the years the creators of The Witcher have learned a lot, and the backgrounds as well as the foregrounds they create make a much more believable impression. I happened to witness a couple of situations while playing where the game made me feel that it has reached new heights. Be it the introductory scene before the fight with the giant or the street chase; there are scenes, dialogues, or even individual animations that show that the game can push the envelope even further. Some of this certainly comes from the fact that the developers were able to concentrate their efforts on a smaller piece of content than the base game. Still, it is nice to see an expansion that delivers the things we know and love, only in better quality. But let's get back to our protagonist enjoying his “holiday”. It’s a good moment to mention one of the most important items – the key to the Corvo Bianco vineyard. Yes, the witcher gets some real estate and yes, he can expand it by spending his hard-earned crowns. It's a good means of using up one's wealth, as the development of the vineyard costs quite a lot. And what's in it for us? First of all, there are some practical benefits. 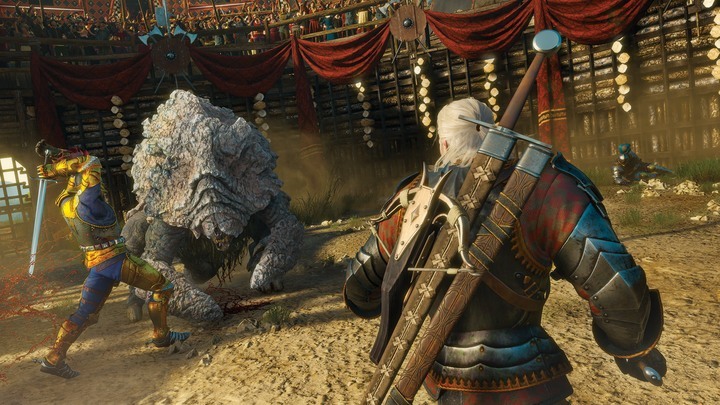 We can bring a world-class sharpening stone to our backyard; improving the stables increases Roach's endurance while improving the bed – Geralt's. There are, however, some other, purely cosmetic bonuses. Hangers allow us to display unused armor and swords, and the walls can be used to put up various paintings and images. Finally, there are the little things like the laboratory or the library, where we can dabble in ingredients and read books, respectively. The beautiful thing is that some of these places are symbolic in a way. This library, for example, is not some special location, and the interaction available there, "read a book," is simply a shortcut to a bookmark in our inventory. I, for one thing, am one of those people that bring books to the closest inn to read them, even though I could just as well do it in the middle of a swamp; so of course I love this solution. Who knows, maybe we will actually be able to get attached to Corvo Bianco. When it comes to the little things, a lot can be said about the new features that are going to appear in the add-on. While in the case of Hearts of Stone we got mostly the story and a single main piece of mechanics, this package will be much bigger. In total, there are twenty brand new creatures, and the developers dared to sneak in a couple of changes even to such trifle things as markers on the map – there are several new types of activities, which can sometimes change on the fly, and some other times lead to a quest. The visual experience is further enhanced by the fact that together with the aforementioned grand master level armor we get a set of dyes, which can be freely used to treat the elements of our gear. All those small facets of the expansion make for a very positive impression, as there is a lot to be explored and plenty of different mechanics to play with. Blood and Wine shapes up to be a culmination of what The Witcher 3 does best. The first few hours are a string of one interesting scene after another, alternating between investigations and monster hunting, and dialogues and spectacular chases, and nonchalantly topping it all with battles against a variety of opponents. At the same time, the amount of content surrounding all of this is enough even for an inattentive player to squeeze dozens of hours out of this expansion while playing with the new mechanics. It's actually less of a new piece of the story than it is another solid portion of The Wild Hunt. Elex hands-on – can this game turn out to be a great RPG? Will Assassin’s Creed Origins be a full-fledged RPG?